I’ve seen many bighorn sheep petroglyphs while out exploring the desert, but for some reason this one has always seemed to stand out to me. 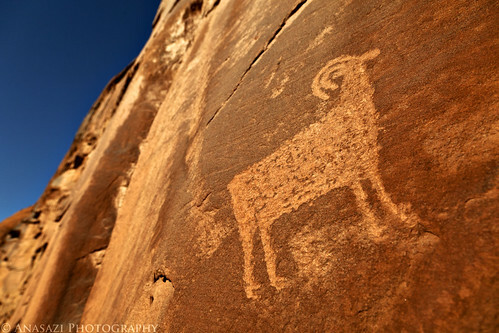 I consider it one of my favorite sheep petroglyphs, and have visited it a number of times. It’s carved on a canyon wall along Kane Creek near Moab that has many other petroglyph panels nearby, including some that are quite large and impressive- but for some reason I always gravitate back to this precisely pecked petroglyph (say that three times fast! ).